Monte James, is a lifelong fan and participant in the great American sport of rodeo. Monte's rodeo career started at the age of 5 riding calves and steers then on to bulls and barebacks in the National High School Rodeo Association and on to the Mid States Rodeo Circuit. After a rodeo injury at Vermillion South Dakota in 1999, Monte packed up his spurs and picked up a microphone and turned his focus to another lifelong love -radio. Monte got our start of one of our original affiliate stations KBRX in O'Neill, NE. His groundbreaking show the "Sioux Steel Rodeo Report" was broadcast to rural communities across 5 states from WNAX in Yankton, SD. This prototype evolved into the weekly Territorial Rodeo Update now heard on over 50 stations across the Midwest and growing daily. This unique show follows Heartland P.R.C.A. Rodeo athletes as they progress in the standings throughout the year all the way to the National Finals Rodeo. TRU is fun, fast paced, well produced and very popular with advertisers and listeners alike! Monte also performs the announcing duties at rodeos and bull riding across the Territorial coverage area. In addition to being a full-time single parent, your host enjoys hunting, fishing and fossil hunting with his son Parker and nephews Shaylor and Shayce. 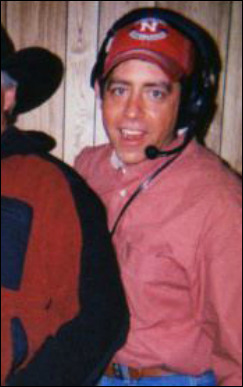 Mitch was born in Rapid City, SD and grew up in Gordon, NE and started in the radio biz in 1990 at KSDZ in Gordon. After leaving a few times to work at KKLS/KKMK and KEVN in Rapid City, SD and KOKZ in Waterloo, IA – as well as stints driving truck, planting trees and throwing brick, block and mud around – he's back at “The Twister” in Gordon and has been since 2000. As with most folks working at a small town radio station, he wears a lot of hats including, but not limited to, sports director, traffic & billing director, news director, psa director, IT guy, producer, fill-in on-air announcer/dj/talent (your choice), assistant toilet scrubber and part-time assistant engineer. Mitch is the proud father of Noah and Sam, who keep him busy and blessed. He also enjoys long walks on the beach at dusk with some sort of fruity drink in a coconut shell with an umbrella sticking out of it.... preferably an ocean beach but the banks of the Niobrara and something in an aluminum can will have to suffice in the meantime.